(P1) Facebook users on Android devices are being notified that they will no longer be able to access messages without the Messenger app. (P2) The function for members to read messages by accessing the social network on a mobile phone web browser is being disabled. (P3) A message currently appears informing users of the coming change. On some handsets, the Play Store then launches. 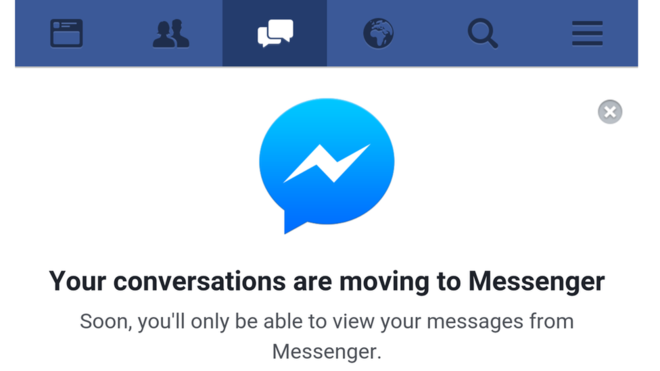 (P4) Facebook said the move is an extension of its 2014 Messenger policy. (P5) “Using the Messenger app is faster and enables richer interactions. We’re continuing to bring the best experiences we can to the 900 million people on Messenger,” it said in a statement. (P6) Messages are already inaccessible via the official Facebook app. (P8) Some users have complained that they do not wish to use the app, citing battery life and privacy concerns. (P10) Analyst Martin Garner from CCS Insight told the BBC messaging is a key area for the company. (P11) “This move underlines what an important platform messaging is becoming for Facebook,” he said. (P12) “Messaging is undoubtedly the next growth driver for revenue but it also will be key to developing highly sophisticated artificial intelligence solutions. Do you think it was a smart move by Facebook to move conversations to a separate messenger app? Why or why not? Which messenger app do you use? Why? In paragraph 7, Dean Coldeway said Facebook made a hostile move. Do you agree or disagree? Why? How many users are on Messenger? What are the 2 main problems users are saying about the Messenger app? ONE BILLION DOLLARS DISAPPEARS – WHERE IS MOLDOVA’S MONEY?